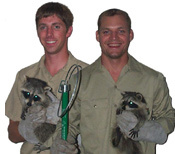 © 2019 Wildlife-Removal.com - site content, photos, & maintenance by Wildlife Removal Animal Control, all rights reserved. - How to Trap an Armadillo guide. For a complete list of all my articles, see my site map. You won't ever solve a nuisance bat problem unless you find the points at which they are getting into your home and then take steps to remove them. In most cases, this will mean sealing up holes and repairing cracks and similar damage spots, and by doing this, you can protect your home or building from most nuisance wildlife problems. Bats can squeeze through a gap that is just three-eighths of an inch wide. That's a very small hole and can easily be overlooked, especially if you don't know what you're looking for. If you don't seal up one hundred percent of all bat entry points, you won't get rid of the bat colony, so if there are a hundred 3/8 inch holes in the attic (for example), you will need to make sure that each and every one of them has been sealed, with materials that are fit for the job. Bats are flying mammals, so you will need to look up if you want a chance of solving this bat-shaped problem. They are nocturnal creatures, so heading out at dusk and dawn will give you the best chances of success. You will likely see them — or the silhouette of them — flapping and flying around. If you look closely, you might even see where they are getting in and out. That's where you will want to start your find-and-seal mission. If you have access to a ladder and a second person (for safety reasons), you can head up onto the roof to look for entry points. If you have tiles, check each and every one of them. Tiles that have gaps and spaces, either by design or otherwise, will be prime spots for wild and nuisance animals to target. Fascia boards seem to get hit a lot too, as do the gaps in eaves, brickwork, the places where walls meet, chimney stacks ... In short — and without listing every single spot — everywhere up-high on any building is a target. There are a number of things that'll give the bat game away once you start looking for signs and physical evidence. Bats have quite greasy or oily fur to start with, and this will leave a brown, greasy-looking stain on the materials and surfaces that it comes into contact with. If a lot of bats use one particular hole to get in and out of your attic, that hole will likely have a lot of brown, greasy stains around it. Another very common physical sign that you have bats in the attic is actual bat poop, called guano. This stuff is not pleasant at all, carrying disease threats just like the feces and urine of most nuisance wildlife, but also very corrosive in nature. 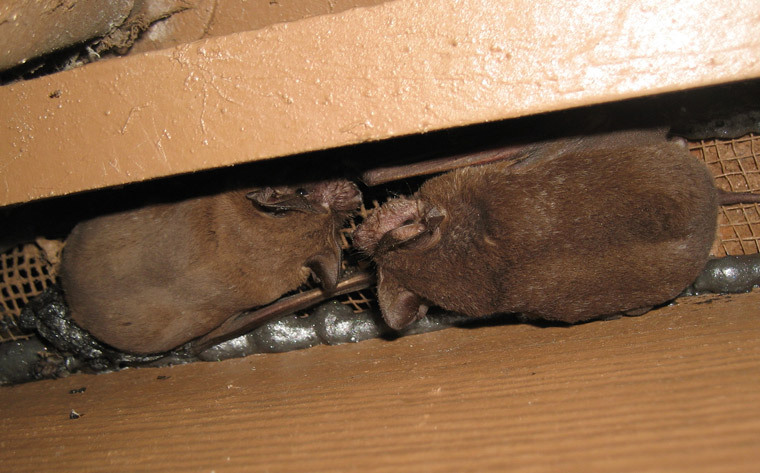 A buildup of bat guano could easily corrode away floors, ceilings, walls, and more if left for a long period of time. If a bat infestation is not spotted early enough, there could be quite a lot of damage caused and the costs mount fast. Sadly, although obvious once you actually start looking for them, these physical signs of bats and bat holes are usually missed for a long time, leaving the animals free to cause as much damage as they like. A few bats wouldn't create enough guano for it to be seen from the ground, at least not for a while. Unless you go looking for that staining left by fur-rubbing too, there's a pretty chance you'll miss it entirely. This is why it's very important to inspect your home properly every now and again. The smallest of missed holes could lead to the biggest of nuisance wildlife problems. Read more about Bat entry holes: What they look like and how to find them.